John McCutcheon is the best-known hammer dulcimer player in North America. He will be making an extremely rare appearance in Nashville on Saturday, February 9th. Long recognized as a master songwriter, he is a robust voice in the tradition of his mentor, Pete Seeger. He has created a body of work that celebrates peace, decency, and conscience with a mastery that is without equal. 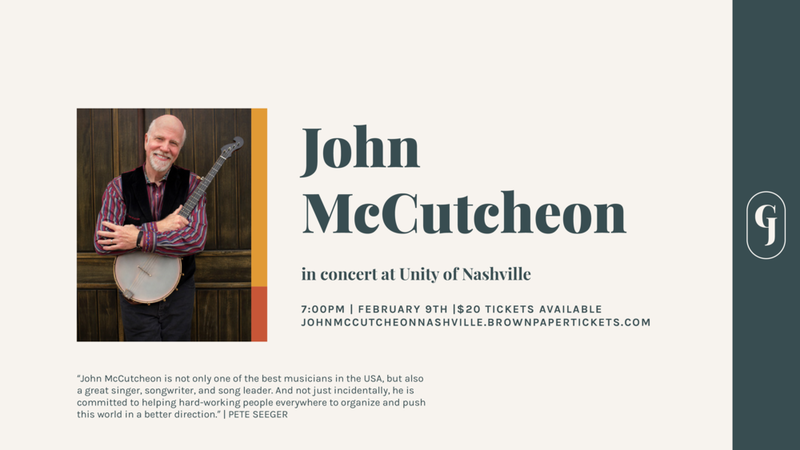 All tickets are $20 for the event on Saturday, February 9th, at 7:00PM at Unity of Nashville. Tickets can be purchased online through 5:00 pm on Saturday February 9th. Additional tickets can be purchased starting at 6:00 pm in our Bookstore, located in the lobby of the church.